Lucy Scandrett is a professional harpist and teacher in Hilton Head Island, SC. Since she moved to Hilton Head Island, she played for the Hilton Head Choral Society, Savannah Philharmonic, plantations, churches, and historical locations. She is a native of Charlotte, North Carolina, where she started the study of the harp at the age of three with her late mother, Elizabeth Clark. She began her professional career at the age of 16 playing the Fantastiks at Barter Theater in Abingdon, VA. She went on to obtain a degree in Harp Performance from the Oberlin College Conservatory of Music where she studied with Lucy Lewis. In addition, she received a Master of Music degree in Musicology from Converse College in Spartanburg, SC where she was a teaching assistant and performer. Lucy also studied privately with the world renowned harpists and teachers Lucile Lawrence and Alice Chalifoux. For many years, she was the Principal Harpist for the Pittsburgh Ballet Orchestra, the Pittsburgh Opera Orchestra, the Civic Light Opera Orchestra as well as the Johnstown, Butler, McKeesport, and Westmoreland Symphony Orchestras. Lucy also was the solo harpist with the Pittsburgh New Music Ensemble with whom she recorded contemporary music for CRI records. She played for Gateway to the Arts and was a soloist with orchestras and in recital. She performed for numerous shows and performers such as Aretha Franklin, John Denver, Josh Groban, Yul Brynner, Joan Sutherland, and Luciano Pavarotti. Lucy was the adjunct Professor of Harp at Indiana University of PA, Chatham University, Seton Hill University, and Geneva College. She maintained an extensive private studio in Pittsburgh, taught harp at The Ellis School, and Musik Innovations School of Music. She began the Harp Department at the Pittsburgh Creative and Performing Arts 6-12 School (CAPA). Her students in Pittsburgh often performed together at churches and assisted living facilities. Lucy served as the President of theAmerican Harp Society from 1998-2002 and 2006-2010 and was on the AHS Board for 18 years. In 2012, she received the Lifetime Achievement Award from the AHS.Lucy was a member of the trio harp ensemble: Three of Harps. She continues to serve in numerous other capacities with the organization. 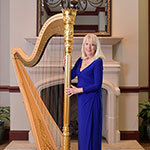 In Pittsburgh, she started the American Harp Society Chapter in 1978 and recently started the Lowcountry Chapter of the American Harp Society in Hilton Head Island, SC.